Colonial Government Research Papers delve into the relationship between Native American Leaders and the Colonist Leaders. This is a Colonial Government suggestion on Colonial Government from Paper Masters. Use this Colonial Government or order a custom research paper, written exactly how you need it to be. "The pattern of white relations with the Indians that was established in Virginia was, with few exceptions, characteristic of the relations that were to prevail everywhere for three centurions the stage of weakness, friendly relations were to be maintained in the interest of self-preservation... When settlements appeared to be permanent, the numbers of whites had grown, and their stock of arms was adequate, the attitude shifted to one of overbearing arrogance." This arrogance often led to betrayals, massacres, and forced migrations of Native Americans in different parts of America as the colonists moved westward. The best that even the most skilled and cooperative Native Americans could do was to try to help their people adapt to the presence and economic and political goals of the whites. In some cases, a Native American leader used skillful diplomacy with the whites to save their people from the worst of the colonists' tactics such as murder and displacement. In most cases, this diplomacy only succeeded in postponing for a short time the inevitable ruin of a particular tribe's way of life. The first significant encounter with a notable Native American leader occurred in conjunction with the earliest colony. This was the colony in Virginia founded by John Smith in the first decade of the 1600s. In an account he wrote, John Smith acknowledged the crucial role of the local Native Americans under the leadership of Powhatan in helping the first colonists to survive. "Our provision being now within twenty days spent, the Indians brought us great store both of the corn and bread already made; and also there came such abundance of fowls into the rivers, as greatly refreshed our weak estates...."
Smith also refers to fish, oysters, and deer the Native Americans supplied to the colonists. Smith acknowledges that the colonists were in extreme desperation, and probably would not have survived if it had not been for the food given to them by the Indians. The Virginia colony maintained fifteen years of friendly relations with the local Indians under the leadership of Powhatan. But shortly after Powhatan died in 1622, his brother Opechancanough became leader and began hostilities against the colonists in an effort to wipe them out. The colonists managed to survive, mainly because by then they had already learned from the local Indians how to grow crops and hunt for food in the wilderness of Virginia. The good relations between the colonists and Native Americans established under the leadership of Powhatan became undone with fatal consequences for Native Americans as America expanding westward over the next couple of centuries. Branch of Local or State Government Research Papers delve into a sample of an order placed on observing a public meeting and focusing on a particular topic being discussed.Order a research paper on state government from Paper Masters. Colonization of New England research papers discuss the British motivations behind settling in New England. British Mercantilism research papers overview the British Government's policies on taxes and regulations over the colonies that included high tariffs. 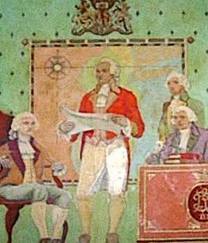 Stamp Act research papers examine the British Government's tax requiring all printed material in the colonies to be produced on specific paper. Boston Massacre research papers discuss the street fight between Boston townspeople and a squad of British redcoat soldiers that led to the deaths of five Americans and a celebrated trial. Declaration of Independence research papers examine the document that was created and signed to announce the 13 American Colonies declaring their freedom from England and British rule. Paper Masters writes custom research papers on Colonial Government and delve into the relationship between Native American Leaders and the Colonist Leaders.